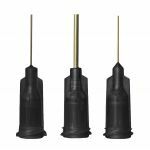 Jensen Global ESD Safe Premium Dispensing Needle Tips are ESD safe Dispensing Tips eliminate the danger of high charges generated by conventional dispensing needles. These Premium ESD Safe blunt tip dispensing needles are available in multiple gauge sizes and 3 lengths, 0.25", 0.5", 1.0". Please contact us for information on additional lengths & gauge sizes. Jensen Global ESD Safe Premium Dispensing Needles are available in boxes of 50 or bags of 1000. Note: Our Jensen Global ESD Safe Premium Dispensing needle tips are intended for industrial use only. They are not sterile and should not be used for medical purposes. Purchase Jensen Global ESD Premium Despensing Needles Today!